ourspake | Where's Our Spake Gone? We are now busy getting ready for our next celebration event: Gornal 1st June at the Library. We will be presenting a new film by Joseph Potts and hosting performances of newly commissioned material by Emma Purshouse and Billy Spakemon, and more besides.. The details are on the invite, we really hope to see you there! 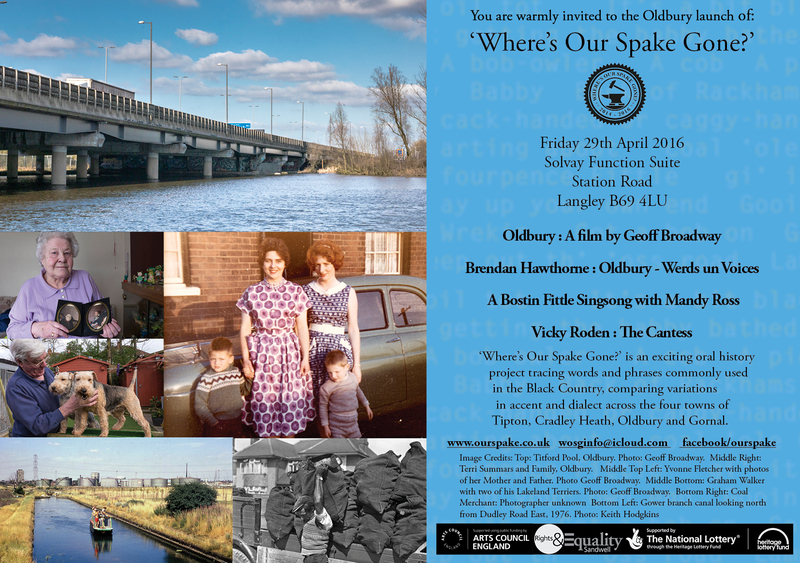 We are now getting ready for the Oldbury event – please see the invite for more information and also note the change of venue. It’s going to be a great evening – we hope to see you there! We had our second celebration event last week at Cradley Heath Library where we shared some of the lovely work produced as part of the project. This included a performance of Yamlet by Little Earthquake Theatre, a performance of new work about local dialect by poet Heather Wastie, and a film with local voices and images produced by Geoff Broadway. You can read more below. It’s been a busy time for the ‘Where’s Our Spake Gone?’ as we move into the final 4 months of this 2 year-long project. Please read on below to find out what we have been up to. We recorded Graham Walker from Oldbury (originally from Smethwick) who shared his thoughts on being part of the Black Country and the importance of treasuring its heritage. Lee Partridge and Jean Sweetland from Oldbury. We met the lovely Yvonne Fletcher to record her for the in-production Oldbury film. We made a short interview with writer Mandy Ross, asking her about her work on the project with various groups around Oldbury that included Young at Heart, Langley Lodge; Year 4 pupils at George Betts School; The Cancer Support Group at Jack Judge House; and KS2 year groups Y3-Y6 at St Huberts Infant and Junior School. Recorded and edited by Geoff Broadway. We are very busy preparing for our up and coming celebratory event in Cradley Heath on the 6th of April. It’s going to be a really good evening that reflects some of really interesting stories, responses and images that local people have contributed.